Engineered and manufactured to exacting specifications for the best Fusion 20 Plantation shutter performance. More moisture and humidity resistant than any timber Fusion 20 Plantation shutter material. Will not crack, chip, split or warp as a shutter under harsh Australian conditions. Better than timber for fixing and fastening characteristics. Constructed with high strength joints using both stainless steel screws and adhesive. Extrusion material is a carbon/ glass fibre reinforced polymer. Does not support bacterial activity. Insulates better than the equivalent timber Fusion 20 Plantation shutter. Does not support fire combustion. Will not sag, creep or deform over time. Contains an aluminium insert for higher strength and increased stiffness. Surface is repairable and re-coat able. Easily cleaned without harsh chemicals. Clever sections and detailing helps conceal substrate imperfections in Fusion 20 Plantation shutters. 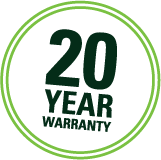 Outperforms all other Fusion 20 Plantation shutters known and warranted to look as good as new in 20 years.